Mostly the magic happens from my couch. A lot of my visual postings like my outfit post come from home. I do have a desk and a chair, however since I have a mac laptop I sit next to my boyfriend, who is on his laptop (he also freelances on the side but website/coding stuff) on the couch with my legs crossed and my mac on my lap with the TV on in the background. This is how most our nights and Sundays are spent. This is why I choose NOT to do any events or blog post on Friday nights and Saturdays (those days are meant for us). Where do you guys blog? Another score for the couch (erm, futon). Since I work from home, the desk is reserved for my work laptop and that's where "work" gets done 90% of the time. For my own Internet stuff (as well a freelance assignments, etc. ), the futon in front of the TV is where it's at. I normally do my freelance stuff in the wee 4AM to 7AM hours so I can spend as much of evenings as possible with the fiance since we're both super laptop oriented. Lol! You could totally replace my husband and I in that photo. I've been using the bedroom but I sometimes end up next to him, looking just like that, while he's on his computer. I didn't get a chance to photo but this is exactly how my husband and I look on our couch too. We sit side by side with our laptops. He has the same mac as yours but I am happy with my vio. 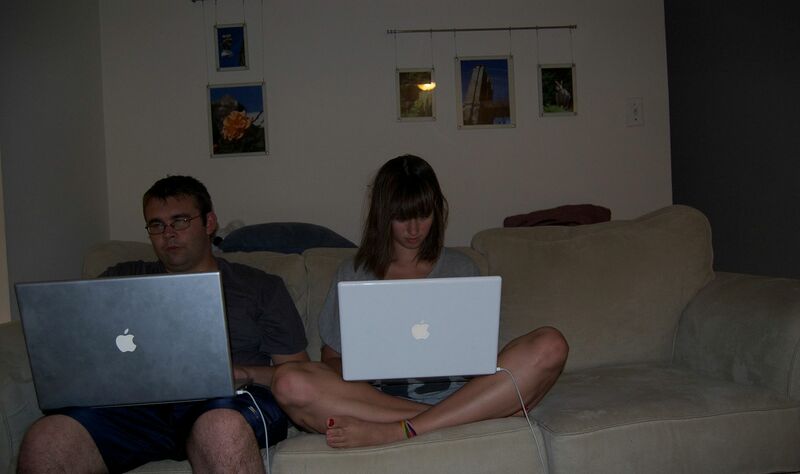 My husband and I use our laptops from the same room but rarely sit beside each other. We have chairs and a half and we each have our own. Sometimes we may go over to one of the couches though. Currently we both have mac laptops but I still didn't even transfer my files from my Thinkpad so that is still right there by my chair if need be. I love the picture of the two of you together! It's so nice to be able to do your own thing together.